This is the first bit of official information on the 2019 Dodge Challenger and while the details are short, we know that the SRT Hellcat models will sport a new hood design. It is unclear whether this will be the standard hood on all 2019 Hellcat Challengers or if it will be an option, but there is no question that this new bonnet will allow the new model year to stand out from the 2015-2018 cars. Back in the 1960s and 1970s, many Mopar muscle cars came with dual hood scoops in many different designs. While the Shaker hood and “six-pack hood” draw the most attention among classic Dodge performance cars, the 1970 Super Bee and the 1971 Demon 340 featured twin-scoop design, as did a handful of other Dodge and Plymouth vehicles from the original era of the muscle car. The new dual snorkel design on the 2019 Dodge Challenger SRT Hellcat isn’t quite like any of the classic Mopar designs, with the large twin openings located at the front edge of the hood with the scoop portion extending down the center. The brief press release that came with the picture above explains that the scoops are fully functional, but we don’t know what they do. They could feed cold air into the engine bay or they could channel air to the engine air intake, but in either case, this hood will draw in more air than the current Hellcat hood. The current Hellcat hood has a single, smaller front-facing scoop with a pair of heat extractors on each side. This new hood does not appear to have heat extractors, so perhaps the engineers are pumping more air into the engine bay so they have less concern of venting the heat, but it may improve performance if one of the scoops feeds the engine. 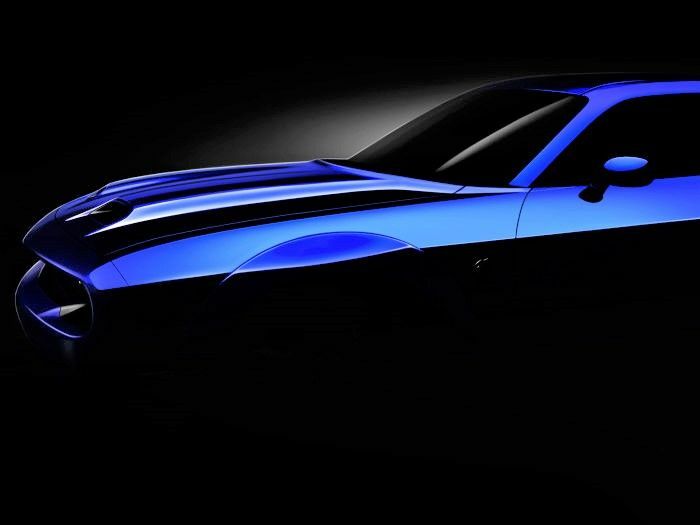 In the shadowy image above, the new dual snorkel hood is shown on an Indigo Blue Widebody Hellcat Challenger, so it seems that this new look will definitely be offered on the widebody models, but it is unclear how else this new body part will be used. Dodge could make this hood an option, keeping the current hood design as the standard equipment, or perhaps this will be a widebody-only feature. We will have to wait and see, but with the promise of more information later this year and so many rumors of more Dodge Challenger performance models coming in the near few years – there could be some surprises under the new hood as well.